Teeth have a natural wear and tear that slowly causes them to lose surface area to chew with as we age. Attrition is the loss of tooth due to mechanical grinding or interaction with other teeth. Bruxism, or teeth grinding is a form of attrition that can occur during sleep and night grinders are often unaware that they are their teeth are witling away while they are not even awake. Nail biting is another habit that causes teeth wear and can prematurely destroy your dental health. Erosion is the loss of tooth due to chemicals such as: acidic juices, carbonated drinks, citrus fruits, hard candy, or stomach acid. Abfraction is the theoretical loss of tooth caused by forces placed onto teeth during chewing or grinding. 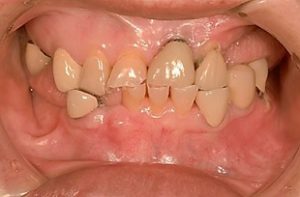 This form of tooth loss is created by forces pushing the tooth in different directions and is shown as lesions along the gumline. 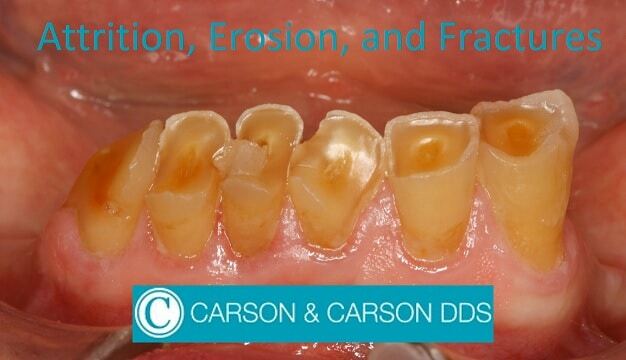 Abrasion is the loss of tooth due to the interaction between a foreign object and teeth. This type of tooth wear can occur via the improper usage of a toothbrush or the repeated clashing of a lip or tongue piercing with teeth. Tooth wear can affect any individual, regardless of age. So, maintaining a good oral hygiene routine is critical in sustaining the health of your teeth for a lifetime. There are a few habits that are particularly damaging to the longevity of your teeth and should be avoided to prevent the erosion, attrition, abrasion, or abfracture of your pearly whites. Be sure to visit your dentist semiannually, at the very least, to avoid being blindsided by attrition that can slowly diminish the sate of your oral health without your knowledge. Frequently drinking carbonated beverages or acidic fruit juices will erode your teeth quickly. Do not brush your teeth shortly after consuming food or drinks that are high in acidity as the brushing can damage the enamel layer recently weakened by this acidic presence. This is a common cause of enamel wear on teeth. Avoid brushing your teeth too vigorously or scrubbing too hard as this can also cause enamel wear on teeth. Use a soft-bristled brush and change your toothbrushes out frequently. Avoid wearing jewelry such as lip or tongue rings for extended periods of time. 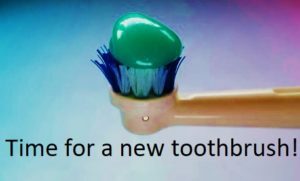 Avoid toothpastes containing abrasives and opt for fluoride based toothpastes instead. Abrasives can remove stains from the outer layer of your teeth, but in doing so they also lead to enamel wear that can expose the underlying, yellow dentin layer of the tooth. On the other hand, fluoride based toothpastes promote the natural growth of the outer enamel layer to help better protect teeth over time. Citric acid from lemons is a common dental problem and completely destroys teeth at an early age. I have seen cases of teen-agers that have ruined their front teeth from sucking on lemons all the time. Browse more of our attrition case studies here. Read our list of common dental problems to learn more about other oral health issues that many Americans face.